How to Shop Yard Sales… for Free! 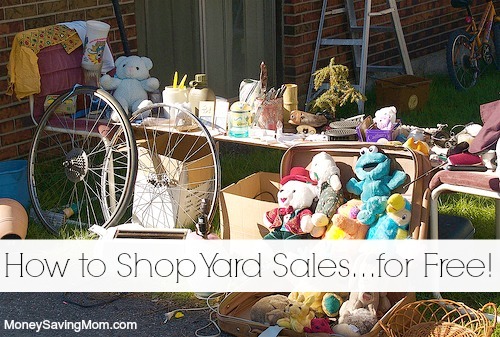 I have become addicted to yard sales this spring, and it’s probably because I have found a way to do it for free! It is no small matter for me to get out of bed extra early and then to get all my kids fed, dressed and out the door with my wonderful, supportive husband, so it really takes something special to do all this just to go shopping. I started out this year with $20 of birthday money, and I told myself this was all the yard sale money I was going to have this spring, so I’d better make it stretch. I started picking up extra items at the yard sales that were particularly good deals, and then I would resell them for a profit. In this way, I was able to get several items for us for free. I made it a goal that however much money I spent at yard sales, I had to sell at least enough to cover the cost of that trip… so I always had at least $20 and I was still getting all sorts of useful things for my family like clothes, toys, gifts, camping supplies, etc. As of now, after shopping for 7 weeks I have upwards of $60 cash! There is nothing like being able to go shopping on Saturday mornings with my family and not feel like I’m breaking our budget. Make it worth your gas. Neighborhood yard sales where you can drive around to many houses close to one another. Fund raisers — we have one that raised money for poverty and everything was donated, so it was all super cheap. Church yard sales where a lot of people set up tables. I find my yard sales on Craigslist and Yard Sale Treasure Map. Find a niche that you know really well. Make sure you know what a good bargain is and how much you can resell the items for. I am in the baby/toddler stage right now, so I know what these things go for. This way I can pick out a good bargain when I see one. My sister-in-law is great with young women’s clothes and goes to warehouses and yard sales and knows how to find a good deal for things like that. So find your niche and stick with it. Be intentional with your shopping. Have a list of things you are looking to buy, and then ONLY buy things you know you can resell with a profit. I tend to buy things I can make at least $4 profit on to make it worth my while. Find a local place where you can sell your items. Craigslist, Facebook swap groups, or some sort of consignment sale are your best options. I personally love to sell my things on a local Facebook swap site where I can create an album and upload pictures of everything I have for sale with the price and description. Then people comment on the pictures and I can know who is interested and arrange a pick up. I have a friend who saves items to sell twice a year at a big sale but I don’t have the space to do that and I would rather have a quicker turnaround. My sister-in-law sells things on Etsy or eBay and that works well for her as she has a wider audience. Don’t go out of your way to meet people when you are selling things or it isn’t really making a profit when you count in your time and gas. I usually look at my week’s schedule and when somebody wants something, I tell them a couple centralized locations that are close to where I will already be. That way if someone is a no show you haven’t wasted gas. I also prefer not to give out my address to everyone. When I go to meet up with people it helps to give them a cell number so they can contact me if they are going to be late. I also try to courteous to others and let them know when I am running late. To sum things up, find a category of items that you know a lot about, find an avenue of selling those items, and it is very possible that you could spend your summer finding all sorts of wonderful treasures at yard sales for free! Stephanie is wife to Joshua and mother to three little ones. Managing her home and caring for her family is a full time job and she enjoys yard sale shopping. She keeps up a blog at www.joshuaandstephanie.blogspot.com and tries to post updates on her yard sale adventures weekly. I do the same thing! I started out going to a lot of yard sales and flea markets and accumulating a lot of great deals and it really takes up space. Now when I go, I always keep my eye out for cheap stuff to resell and of course still shop for the things I want and need. It helps me make some money and I get to keep on thrifting! I have a “Thrifty Finds” section on my blog that has become very popular. I love it so much! I checked out your blog and I just wanted to say thanks! I checked out your blog and I found where you were writing about the Bar Keepers Friends cleaner being for bathtubs as well as the Pyrex. I have been trying to remove some stains from our bathtub for a long time and have tried so many different cleaners and none of them worked. I went out and bought the Bar Keepers Friends today and it worked wonderfully!!! I finally got the stains out!! Thank you so much!!!!!!! I do the same thing! I started with $150. I’m up to $719 by selling baby/toddler clothes and toys. It’s so much fun!! try your town dump too! ours as well as surrounding towns have section where gently used items can be left and taken for free. not unusual to see entire bedroom sets, washers, dryers, etc. my neighbor has scooped up several dressers, did her shabby chic thing and resold at a consignment shop. hit upscale neighborhood yard sales near end of posted sale times – often get higher quality items free or very close to it. Just be sure to check with your city’s solid waste dept., or whoever runs the dump before you do this. In my county it is illegal to take anything from our trash/recycling drop-off locations. Part of the reason is that they sell some materials, such as scrap metal, to fund county services. I’ve found lots of things with tags still attached & profited on eBay selling them…can’t beat that! This idea just hit me a couple of weeks ago, and while I haven’t been to any yardsales, I have been scouring the free ads on Craigslist for items and have gathered a large box of hardcover books. Last night I went to go grab a free coffeetable, and when we got there it was huge and SOLID WOOD.. absolutely beautiful. So we won’t be selling that, but I have high hopes that we can find more items like it or finally start visiting sales! Great tips! You can make a lot of money from buying cheap at garage sales and then reselling! I usually do eBay or Craigslist depending on the item. Also, I just posted about how I did something similar with a pair of shoes I got for almost free using Target apparel coupons and then resold them for $4.50 on eBay! Woohoo! I pick up things that I can sell for profit too when I see them, however it seems like in my area people are pricing their things higher and higher so finding items I can resell for profit is getting harder and harder but still doable if you know what to look for. I find good quality toys that someone did not take the time to clean and therefore sold them for cheap can often be cleaned up well and there is profit in the elbow grease you put into it. For instance, Little Tykes toys clean up well with soft scrub. Smaller plastic toys was up like new in the dishwasher. I think you’re right about sellers marking up items. I do–especially for kids stuff–because I know we have resellers prowling our yard sales. The first year, I marked everything pretty low and still got people who wanted to haggle and people who I suspected were buying to resell. Now I mark things much higher because I’d much rather donate leftovers to Goodwill than sell to resellers. We sell less now, but I feel a lot better about what we do sell. I am a reseller but I dont negotiate on prices because I am know I am trying to make a profit. I know some people get frustrated at us resellers (there are a group in my area) but honestly, I cant understand why. Looking at the lot of us, clearly we are not wealthy. My family pays almost 4000 a month in out of pocket therapy for our son and so getting extra money this way as been really helpful. I think its great that people are resourceful and willing to think outside the box to earn extra income. I guess it’s the difference between someone who really needs or wants your things versus someone who really needs or wants to make money off your things. I think it’s also a matter of style: I’m sure there are lots of resellers who aren’t recognized as resellers because they’re just getting a couple things, not obviously checking for labels, and so forth. Then there are others who are mercenary and clearly not browsing for personal need. If you’ve ever had a yard sale, I bet you know what I mean. It’s like couponers versus shelf clearers. This is a great habit if you avoid hoarding! Living in a townhome complex, my mom and I will find things near the trash that people are getting rid of and sell it on craigslist. All profit! There are usually some nice pieces like fake trees, side tables, and other things that aren’t broken, still useful, and simple to clean. I used to earn all my household money doing this (including grocery money!) and still do it when I want some extra spending money. It’s one of my favorite hobbies! This is a tip that I have an issue with. When I shop at a yard sale, I shop for things that my family needs. When a bunch of people are out there grabbing all the great bargains to make a profit off it, that means fewer low priced items that those of us on a very tight budget can find. I do my best to get out early and all that, but I’m scoping out those $.25 girl’s and boy’s clothes because my kids need summer outfits, not to see if I can sell it on eBay or Facebook for a profit. The price of clothing lots on eBay is more than I can pay. I never thought about that. That’s a really good point. But at the same time, I don’t think that everyone will probably be doing this, so hopefully there are still some good deals out there. 🙂 I suppose one can’t fault her for trying to do the same thing you are trying to do- provide for her family. I agree as well. I wouldn’t feel right about doing that. I also agree. One of my friends was just telling me how she is always picking things up on this local website and then turning around and selling it for more. It is so frustrating to me because I am just trying to get on and find a good deal for something I need but these people that use it for profit always beat me. I know people do this, and sometimes it’s probably to help make ends meet for their family, but I have mixed feelings about it. I was so touched that she did this for me – and also glad that she got the money she asked for it and I got the tricycle for that amount, rather than have someone else buy it and mark it up for another garage sale or to put on eBay. I can see the point of both sides in this reselling practice. For some this is a great way to help provide extra income for their family while doing something they enjoy. Others who are struggling to afford items they need are frustrated that resellers sometimes scoop up all the great deals to sell for profit. Both groups are simply trying to provide for their families. I think one way we can all join together to alleviate this issue is to look for families who need gently used items we are finished with and simply pass on what we can afford to give away. Our children are mostly clothed in nice hand-me-downs from others and my husband and I decided early on that we would always give away items that had been given to us as a way of passing on that blessing. That’s what we do too. We don’t have our own yard sales. I give away what we’re done with instead of selling it. Good job Allyson, thanks for saying this. I have a 3.5 and 18m/o, and I have never had to buy clothes for either of them – I have been given SO MUCH STUFF. My husband and I were living off of 21K a year when I first got pregnant, and we didn’t have to buy anything for our first baby, between hand-me-downs, our church, and our families. I always pass on anything we can’t use that other people can. HOWEVER, just because people are getting stuff we might want, or scooping up the nice stuff because it’s worth more, and they got there first, and we want to complain…. well, I know that, for me, I think it’s probably motivated somewhat by my own selfishness. Because if *I* had gotten there earlier, *I* would have taken the nice stuff. Maybe I would have re-sold it, maybe I would have used it. Either way, I would have benefited from it. I think this might be a case where we all (and I include myself, I’m not trying to fuss at anyone in particular) need to do a better job of attending to our own hearts and actions, rather than judging our neighbors. Because, really, we can’t do ANYTHING about other people’s actions. But we can trust that God is directing the stuff where it needs to go. And that we can help others out when we see a need. Sarah I think you put it the best. I too see both sides but you put it so eloquently. Absolutely true–I had a woman hit our yard sale first thing in the morning grabbing .50 kids’ clothes in a range of sizes. She sorted through for specific brands and bought a ton. As we were closing up, she came back for the rest. She was definitely reselling. The next year, I marked clothes up to discourage this. I’d rather donate to Goodwill. I see your point, but you are assuming that the people who are reselling are not needy. There are times that I have qualified for government assistance but not used it because I was able to supplement our income reselling things. How do you know the person who is reselling is not just as needy as you are? It’s hard work going to a yard sale or thrift store finding items for resale cleaning them, making sure they are not broken, posting them on craigslist, answering emails then dealing with no shows. This is American hard work and ingenuity and I’m grateful for people who think outside the box. The other day I heard Dave Ramsey praising a guy who lost his job and started reselling golf clubs and is able to make a living out of that now. Its all about perspective. I’ve started to budget for a new big ticket item we need to replace, but not in a hurry. If I can find it at a garage sale used, the balance is mine to spend on future garage sales. If not, we buy the item at the end of garage sale season. No harm done to the budget. Last year we were working up to a $450 budget for a “new” 6 seat breakfast room table. We found a beautiful, solid wood set for $80 in just a few weekends of hunting! This year we’re hunting for a “new” arm chair for the living room with a $250 budget. Great ideas! I have to be careful I don’t spend more than I have budgeted at rummage sales and I have about 4 bins of baby clothing I need to post on facebook….maybe I should get going on that so I don’t feel so worried about what I spend at rummage sales the rest of the summer! That will be at the top of my to do list for next week. Thanks for the encouragement. I should clarify, I don’t buy anything just to resell it, but I do look for items that are cheap and if I happen to get a little more for it than I paid (not usually), it helps cover the cost of my time spent taking pictures and organizing the items for sale. We currently don’t have anyone to pass our items onto as everyone else we know has older children or boys and we have girls. I am still passing the items on to someone else, just for a small amount of money. I love going to yard sales and thrift shops. I don’t buy clothes or toys to resell because I think that so many families are struggling and if there are great deals, I want them to find them. I do buy other items that I will then resell because I view those items more as a luxury want and not a need. I read through all of your yard sale find posts and love them. I have been doing the same thing for two years now. I don’t know if it is because I live in CA and things are more costly, but I think you sell things way too cheap. I think you could get more money for them 🙂 And for those costumes – dont sell them locally, instead list them on Ebay starting Sept. – super easy to ship and you will get a whole lot more for them 🙂 Again, great read! Some people here are saying they mark up prices at their own garage sales just to discourage resellers, and I can’t help but think of what you’re doing to people who actually need to buy their clothes from a garage sale. Donating to Goodwill is exactly the same as allowing a reseller to buy the item. Goodwill gets all of their products for free yet has increased their prices to the point that they’re no longer a bargain. I’d rather keep the money out of corporate pockets and in the hands of the “self-employed”. I’m really surprised that there’s such a controversy about this! We are planning on having a garage sale this summer, and, while I’d like to make a profit, my main goal is to declutter our home. I guess it doesn’t really matter to me if resellers buy our stuff – we just want it out. We are selling used home decor items, and a few odds and ends, though. We’ve purchased a lot of baby items used. We didn’t always get rock-bottom prices, but the prices were certainly better than if we’d purchased them new. Maybe I’d feel differently if we were selling things that people really need. Definitely food for thought. It is always funny to me that there is controversy about this too. I have added money to our families income by reselling items- mostly toys and books. It’s not like someone goes to McDonalds or JcPenney and gets mad at the CEO for the ridiculous profit they are making on items. Plus, many stores carry clothing that is made in sweatshops overseas – which is far more unethical than what I am doing lol. I have been all three positions of selling and reselling and buying. I have sold items at garage sales for dirt cheap, knowing that a reseller could have been there and not caring because I didnt want to hassle with it. I have also had needy people come to my garage sales, and I give them many things for free – to the point they are hugging me. Not only that, but I also seek out new moms to help constantly (I dont say this to bring me glory, just to clarify that I am not some money hungry reseller). Then on the reselling side I help keep out used items from the junk and give them new life, while helping my family out a bit. Then on the buyer side, I buy several items from Ebay too – I know that the $12 Express jeans I bought were probably a .25 garage sale find for the seller, but I am A. Happy to pay a cheaper price than retail and B. Happy to support another individual in their humble way of making a living. Exactly. Who are we to judge if we’re living responsibly and frugally. I say kudos to them for going to the hard work and effort of reselling. Those who “desperately need” money or these items are perfectly capable of doing the same thing if they choose to make the effort. I’m surprised at all the controvery here too. I guess I just don’t understand why anyone having a garage sale would care who buys their stuff or what they do with it. If people are particular about who gets their unwanted stuff or truly want to help those in need, why not just donate to an charitable organization that you want to support? My first thought when reading this post is that it seems like an awful lot of time and effort for a very small return. $60 earned in 7 weeks? That’s $8.50 a week. Isn’t your time worth more than that? I would think so. Minimum wage is $7.50/hour (in most states). I mean, if you enjoy it, go for it. To each his own. The author obviously enjoys it. And the title is “how to shop yard sales for free”, not “how to make money yardsaling.” But it’s a hobby, not a job that’s going to make anyone much money. I have mixed feelings about this, especially since I am currently pregnant with our first and on a tight budget. I get annoyed if I see something marked up at a garage sale or on craigslist, if I just found the item for a fraction of the price at a garage/rummage sale. I guess it’s the non-negotiating part that annoys me the most. For example, I found a gently used Bjorn at a rummage sale for $15, then see people posting them on craigslist day after day for $40-$50. I would never pay that much for one knowing how cheap I can get them at garage sales, and apparently no one else is interested in paying that much either since people keep reposting them. I think that’s just a personal decision depending on where your family is right now. If you know a specific person that you could bless by passing on your no longer needed items, or if you’re in a decent financial position, then it may be best to pass them on for free. If you’re in a more difficult financial position, it’s also just fine to provide a service of selling your items for a higher price in a more convenient way. There may be some moms who have a little more money to spend but don’t have time or energy to make it out to rummage sales, who are happy to pay a little more to get something on Craigslist or Ebay. I belong to a local fb swap group. I have gotten several great deals and have sold a lot of our used items. Reselling for profit is frowned upon and has caused a lot of drama in the group! Sometimes a mom will sell something to someone and then see that person reselling it for more just a week later! The general rule of thumb is if you buy something and it doesn’t work for you, resell it for the same amount. I guess that is just the culture of this particular group, but if anyone wants to try this method figure out the ins and outs of the group you are reselling in first! I have been doing this full time plus (plus meaning way more than 40 hours most weeks) for 7 years this month. My husband helps me as much as he can after work and on weekends. It is very time consuming cleaning, listing, and shipping items. This conversation has actually been pretty civil. Where I am from, utter disdain for resellers is almost universal. After 7 years I still cannot understand why people almost always respond with instantaneous disgust if they suspect you are a reseller. The number one conversation I hear at rummage sales/garage sales is people bashing resellers. I have been sworn at and called vile names. I am frequently asked if I am going to resell my items, and have even been told I cannot purchase if I am going to. ????What???? I truly still cannot understand the mindset of people who think reselling used goods is evil. In all these years I have never once haggled over a price. I am always kind and considerate and don’t clear off entire tables. Every single time someone spies an item in my arm and asks if I’m “really” going to buy it, I give them the item with a “I have plenty, you can have this!” The dealers that I know in my area also behave this way as well. Very few people are making tons of money off each item. On a per hour basis, resellers make far less than the people throwing the garage sale. If you sell on ebay, you always run the risk of returns and fradulent buyers. You have to pay taxes on your earnings on ebay (and craigslist if you are honest). Garage sale holders don’t have those factors. Antique store owners, consignment shop owners and other merchants of used goods are not viewed with as much hatred as those who sell on modern venues like craigslist and ebay. I agree. I don’t even really resell- I just tend to buy things at garage sales if I know that my children can use it for a while (if it’s dirt cheap) and then when we’re finished with them, clean them up and resell them for the same or for more than I typically paid for them because I take good care of them (unless there is a mother I know who is in need of something, then I often just donate it if I can). And, because I NEED the money to afford next year’s clothes for them! We have practically no clothing budget and I have to be creative. I haven’t gotten hand-me-downs from others and have had to buy almost everything for my children. Sometimes I cannot AFFORD to just donate these items. While I would LOVE to be able to do that (and do when I can), our budget is VERY tight right now and I use the money that I get reselling these items to buy clothes for MY boys. My responsibility is to provide for my family. I shouldn’t feel guilt if I can’t afford to donate a baby item and choose to sell it instead. I put the time and effort into it and I should get something from that. I have three boys and they are growing fast and it’s expensive to clothe them! If someone has the money and will pay “X” amount of dollars for it, then that’s their prerogative. I’m not forcing you to buy my item at this price. If you want it cheaper, keep looking, you will find it- just like I did! It just takes patience. I took the time and invested the hours in searching for the cheap items (and passing on the more expensive ones) and others are perfectly capable of doing the same in my opinion. I just bought a few DVD’s that I’m planning on reselling at a children’s consignment sale. I paid the previous owner exactly what he was asking for them but I know that if I take the time to bag and label them I can make more than what I paid. I have no problem with someone purchasing something at a yard sale to resell as long as they don’t try and badger the owner into giving it to them for next to nothing. A man offered $5.00 for working washer at a yard sale I was having last year because he just couldn’t do any better than that because he was in the resale business. His offer was declined. I had a woman a couple years ago refuse to buy anything that I didn’t come down on the price by half. And she took up about 30 minutes of my time going through each item she’d grabbed. But is someone wants to pay what I’m asking and they think they can sell if for more elsewhere, go for it. Just don’t expect me to give it away.